Abbotsford, Good numbers attended four weeks of gospel meetings by Gordon Williams and Bryan Funston and blessing was seen in salvation. Langley, The conference on April 13 was well attended by many of the saints in the area. Helpful ministry was given by Jim Currie, John Frith, Bryan Funston, John Riddle (England) and Gordon Williams. Vancouver, The Easter conference was well attended with help given in the ministry and preaching of the gospel. The seven brethren who shared in the conference were A. Bergsma, J. Currie’ B. Funston, G. Goff, D. Richards, J. Riddle and G. Williams. West Richmond, The saints have been encouraged recently by three sisters being added to the assembly. Thylorside, A good number of young Christians gathered for the annual conference on April 5 and 6. Speakers were Jack Gould and Lorne Langfeld, and the ministry was profitable. Bolton, Prayer is requested for a gospel tent series in Brampton which Jim Jarvis and George Patterson expect to hold from July 19 to August 17. Collingwood, Local brethren conducted weekly children’s meetings in Stayner with excellent numbers and one child professing salvation. A young brother was received into fellowship in May. Huntsville, Gospel meetings by William Metcalf and Murray Pratt were well attended and blessing was seen in salvation. Kenora, The saints appreciated visits in March from Andrew Bergsma, Jim Webb, Jack Could and John Norris. Mimico, Three were baptized on April 13 and a girl professed to be saved the same evening, bringing much joy to the saints. The Bible reading conference in April was profitable, with much help given to the many young believers present. Newmarket, The conference on May 5 was encouraging. Several of the Lord’s servants were present to help. Both the Bible reading and ministry were very practical. Previously, the saints appreciated a visit by William Lavery on April 24. St. Marys, The assembly recently enjoyed visits from Eugene Badgley and Marvin Derksen. Prayer is requested for tent meetings which commence on July 7. St. Thomas, Interest has been seen in a work carried on weekly at the Farmer’s Market in Aylmer. Paul Kember and William Metcalf plan tent meetings in that area starting the middle of June. Sudbury, Larry Steers was with the assembly in April for a Lord’s day preceded by four nights of encouraging ministry. Prayer is requested for tent meetings in Azilda which Alex Dryburgh and Wallace Buckle expect to commence on July 7. Toronto, On April 14, the hall was full at Broadview as a young married man obeyed the Lord in baptism. In view of the city-wide gospel effort by David Oliver and Marvin Derksen in the fall, monthly united prayer meetings are being held, alternating between east and west end Gospel Halls. Victoria Road, Children’s meetings by Ed Miller were most encouraging. There was a good turnout of children and the hall was full on the final night. Bathurst, Albert Hull and Ken Taylor continue in house meetings in this needy area, with strangers present. The two Christian couples living here have a deep exercise for this place. Fredericton, The conference was the largest to date. The ministry was practical and there was blessing in the gospel which was a cheer to the assembly. Tracadie, God graciously visited in salvation during seven and a half weeks of gospel meetings by Gerard Roy and Larry Buote. David Gilliland (N. Ireland) expected to visit the Maritimes from May 17 to July 1. 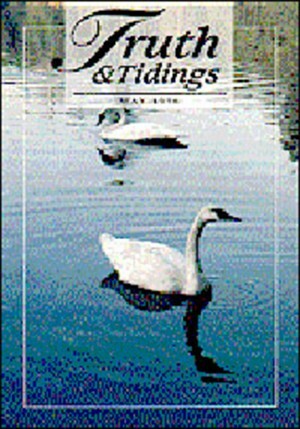 Bridgewater, Prayer is requested for gospel meetings which Albert Hull and John Dennison expect to commence in July. Nineveh, The Easter conference was profitable and most encouraging with blessing in the gospel. The attendance was the largest to date with 700 meals served on Saturday at noon. River Hebert, The saints had appreciated visits by Ken Taylor on April 11 and 21. Charlottetown, The assembly has been encouraged with over 70 children at Friday night children’s meetings. Most of these children are from unsaved homes. Peter Orasuk was contacted through these meetings when his daughter was invited to attend years ago. L‘Anse au Loup, Murray McCandless and Jonathan Procopio returned for a short visit for ministry and gospel following their recent fruitful meetings here. Forest Grove, Roy Weber started meetings in early May. Salem, Harold Paisley gave appreciated ministry in mid April. San Diego, The saints appreciated a visit by Doug Howard in late April. Brother Howard also gave help in Salem, OR. Burwell, Robert Orr was with the saints on April 28, 29 and 30. Omaha, The Christians enjoyed a recent visit from Doug Howard. Willmar, There was some blessing in salvation during recent gospel meetings by Robert Orr and Roy Weber. Cedar Falls/Waterloo, The April conference was large and profitable with help given by a number of the Lord’s servants. Prior to the conference, joint Bible readings were led by J. Webb, A. Dryburgh, E. McCullough and J. Portman. Manchester, Fred Krauss enjoyed a three week visit to Iowa and Wisconsin, giving ministry here and other places. Mason City, Robert Orr and Roy Weber expected to commence gospel meetings on May 12. Stout, The recent conference was considered to be a time of blessing. Thirteen of the Lord’s servants shared in ministry and gospel. Black River Falls, George Patterson and Jerry Jennings had two weeks in the gospel in April. Blue River, James Smith and John Slabaugh continue with gospel meetings. The Lord has been working and souls have been saved with potential for more. Saginaw, The saints enjoyed help from Jack Nesbitt and Stuart Thompson at their all day meeting on May 5. Sherman, Prayer is requested for a gospel effort by William Lavery and Stuart Thompson in June. Akron, The saints were greatly encouraged by the interest and blessing in their recent gospel meetings. Joel Portman gave profitable ministry the last two nights of April. Monticello, Cleveland, A man who attended Sunday School 30 years ago has started to attend the meetings. The assembly also had joy from a young man who was saved in the Akron meetings and who is to be baptized shortly. Lorain, Jack Nesbitt had a short visit and the Christians appreciated his coming. Mansfield, On April 26, Gene Higgins closed two weeks of well attended gospel meetings. The hall was filled and there was a real interest by strangers who attended. Tampa, The saints enjoyed a month long visit from Douglas Reid of Costa Rica. Brother Reid had two weeks of ministry on Christ and the Church, before returning to Costa Rica to resume his work there. East Aurora, Norman Crawford had five ministry meetings in early May. Bryn Mawr, R Harding gave ministry on I Peter from April 29 to May 1 and the believers appreciated his visit. Donora, From April 14 to 18, William Lavery gave helpful ministry from the Song of Solomon. Hatboro, John Dennison and William Seale continue in the gospel with good interest and some blessing in the second week. Indiana, Walter Gustafson visited here and in Donora for ministry prior to the McKeesport conference. McKeesport, The conference was well attended with many young believers present. Ministry was given by ten brethren and there was excellent evidence of the leading of the Holy Spirit. McKeesport Gospel Hall Benevolent Fund, c/o William A. Seale, 12889 Deborah Drive, N. Huntingdon, PA 15642, phone (412) 863-2949. This fund was formerly the Bryn Mawr Gospel Hall Benevolent Fund, but has been transferred to McKeesport because of Rob Oliver’s relocation. The fund continues to help with the monthly expenses of medications and with other medical expenses, therapy and injury related costs. Our brother is furthering his education with the expectation of supporting his family. The fund is maintained for assemblies or individuals who wish to help. Rob is thankful beyond words for the past kindnesses of God’s people. Livingstone, The assembly was refreshed by the conference on May 4 and 5 when J. Dennison, W. Gustafson, E. Higgins, D. Oliver, W. Seale, R Tornaquindici and D. Vitale ministered the Word. On Lord’s day evening, E. Higgins and D. Vitale began gospel meetings. In preparation for these meetings, the assembly had distributed 27,000 notices. Pennsauken, The monthly area Bible reading on May 5 considered James 4 and was opened by John Dennison, who received help from W Seale and local brethren. The reading was practical and helpful. Methuen, The conference on April 21 was well attended and the saints were encouraged and strengthened by excellent ministry from Murray McCandless, David Oliver, Jonathan Procopio and Frank Tornaquindici. Banbridge, J. Milne and N. Tinsley (Lisburn) are having gospel meetings in an Orange Hall about four miles from the town, a place where the gospel has not been preached for many years. Belfast, The annual Easter conference saw large attendance from April 6 through April 10. Helpful ministry was given by various speakers with two sessions for reports on the Lord’s work at home and abroad. The large hall was full for the final gospel meeting taken by Norman Crawford. D. Kane and D. Williamson are preaching the gospel in the Ebenezer hall. The meetings are encouraging although the city has become a very difficult place for the gospel. Bellaghy and Limavady, Both of these Co. Derry conferences were well attended and help was given to feed the saints of God. Birches, T. McNeill is preaching the gospel in a portable hall. Keady, J. Martin and A. Davidson have commenced in a garage outside this border town. Kilmore, W. J. Nesbitt and A. Nesbitt have started gospel meetings. Newtownstewart, R. and N. McKeown are preaching the gospel in this needy area. Rathmines, The annual conference was held on May 4 with ministry from various brethren. June 29 and 30 in Westsycle Gospel Hall, 849 Wawn Road, with prayer and ministry on Friday at 7:30 p.m. Bible reading on Saturday at 9 a.m. on 2 Tim. 2. On Lord’s day, Breaking of Bread at 9:30. Corr. Philip G. Atkinson, 836 Puhallo Drive, Kamloops, B.C., V2B 6P7, phone (604) 579-9484. Hall phone is (604) 579-8799. June 22 and 23 with prayer meeting on Friday at 7:30 p.m. Bible reading conference on the Feasts of Jehovah. All meetings in Charles P. Allen High School, Rocky Lake Road, Bedford, phone (902) 832-8964. First meeting on Saturday at 9. Breaking of Bread at 10. Please give advance notice so proper arrangements can be made. Corr. Arthur Hamish, RR 1, Hubbards, N.S., BOJ 1TO, phone (902) 857-9265. June 29 and 30 in the Gospel Hall with prayer meeting on Friday at 7:30 p.m. Bible reading on theYoung Family in the Christian Home (Sat.) and Col. 1:12-23 (Lord’s day). Breaking of Bread at 10. Corr. Harold Elliott, RR 1, Wallace, N.S., BOK 1YO, phone (902) 257-2206. Hall phone is (902) 243-2205. June 29 and 30 in the Gospel Hall, 1611 SW “G” Street, with prayer meeting on June 28 at 7:30 p.m. Breaking of Bread at 10. Bible reading each morning at 8:30 on the Preaching of the Cross (1 Cor. 1:18) – To them that perish (Sat.) – Unto us which are saved (Lord’s day). Corr. Don Gratias, 141 Timber Lane, Grants Pass, OR 97526, phone (541) 479-4521. Hall phone is (541) 476-3956. Comer Brook, NF – June 29,30 and July 1. St. Marys, Ontario, Prayer and Bible Study is now on Wednesday at 7:30 p.m.
Elizabeth Sarah MacDonald of Baddeck, N.S. on January 21, age 92. Our dear sister “Lizzie” was saved in 1952 when Andy Aiken conducted the first gospel meetings in Baddeck. She was a faithful sister who was part of the assembly when it was planted. Lizzie was known for her happy, kind character and this will be left in the memory of all who knew her. Please pray for her children and grandchildren who heard the gospel preached at her funeral. Gerald Jeffery of London, Ontario on March 20, age 89. Our dear brother was saved at age 30 in the Parry Sound district, never having heard the gospel before. He came into fellowship in Orillia and then moved with his wife Helen to London in 1950 when the assembly met on Pall Mall Street. Although he was a quiet brother not taking part publicly, he used his van extensively to bring children to Sunday School. Failing health latterly curtailed his attendance at assembly meetings in Highbury He is mourned by his wife of 53 years. Mrs. Mabel Moffatt of Hinckley, MN on March 23, age 89. Our dear sister was saved as a young married woman while reading a gospel tract given to her by her mother-in-law. Mabel was in fellowship in the Hinckley assembly since its planting in 1985. She was of a very kind spirit and was appreciated by all. Her husband preceded her in 1970. The couple had no children. Robert Orr took the funeral service. Mrs. Anna Entsminger of Preston, MN on March 28, age 95. Our dear sister was saved while attending a Bible conference in LaCrosse, W1 on September 3, 1934. The late Oliver Smith was reading Eph. 2:8,9 to her at the time. She and her late husband Lawrence were in the LaCrosse assembly for a number of years. Since 1983, she has resided in a care center in Preston. She is survived by two sons and their families. Prayer is valued for those not yet saved. The funeral service was taken by Robert Orr. Frederick E. Hill of Saugus, MA on March 30, age 75. For many years our dearly loved brother was a pillar in the East Boston (now Saugus) assembly For over 20 years he faithfully gave news from New England to Truth and Tidings. In April, 1980, he was appointed news editor for Words in Season, a work which he conscientiously performed until his homecall, telephoning many across the U.S. and Canada regularly to obtain up-to-date and accurate information. He will be sorely missed by his family, the assembly, Words in Season and believers across North America and overseas. Mark Lindaman of Hitesville, Iowa on March 31, age 75. Our dear brother was saved on August 22, 1948 during a gospel series conducted by L. De Buhr and L. Brandt in Dumont. He and his wife Viola were received into the Hitesville assembly where they remained these many years. He is survived by two sons and two daughters and their families. His wife Viola preceded him in October, 1994. Prayer is requested for the family members who are not yet saved. The funeral service in the Gospel Hall was shared by Leonard De Buhr, Russell Nesbit and Robert Orr. Margarete Reissig of Bryn Mawr, PA on April 4, age 90. Born in Germany, our dear sister came to the U.S. at age 5. At age 17 she was reached and saved through the testimony of a fellow worker in New Bedford, MA. She gathered with the saints there until the early 1940’s when she relocated to the Bryn Mawr area for work and became associated with the assembly here. She maintained a testimony among those she worked with and her family She leaves two sisters, a brother and a number of nieces and nephews. Many of these in need of Christ heard the gospel at her funeral. Mrs. Alice J. Hutchinson of Limavady, N. Ireland on April 7, age 87. Our beloved sister was saved in 1924 at meetings near Armagh by brethren Curran and Bunting. Widowed in early life, she learned much of God in the school of affliction. Moving to Limavady in 1941, she, with her husband Cochrane, sought to serve the Lord as long as health permitted. Their home was ever open to preachers of the gospel, many of whom were present at her funeral. A son and daughter are comforted by that blessed hope. She also leaves three stepsons, one of whom, Gerald, is in Langley assembly. Elsie (Mrs. Cyril) Lallion of Toronto, Ontario on April 14, age 62. A humble and happy spirit characterized our beloved sister. She was saved the first night of a series of tent meetings in Trinidad in 1964. She emigrated to Canada to join her husband in September, 1969 and was in happy and consistent fellowship in the Broadview assembly until sickness kept her from attending. Our sister loved the Lord’s people and was a real help in the assembly. A large number attended the funeral to share the deep loss with our brother Cyril and their four children. Gordon R. Good of Charlottetown, P.E.I. on April 15, age 86. Our esteemed brother was saved in February, 1956 during gospel meetings by Albert Ramsay and Robert McIlwaine in Charlottetown. His heart’s affections were with the assembly where he was deeply appreciated. He manifested a real faithfulness to God’s assembly, being active as an overseer for over 30 years. The large number that attended the funeral was evidence of the high esteem in which he was held. He is survived by his wife Dorothy, two sons and three daughters, all of whom are saved. Mrs. Ella M. Blair of Sarnia, Ontario on April 17, age 95. Our dear sister was born on November 10, 1900 and was born again on September 24,1913, during gospel meetings in Winnipeg. She was predeceased by her husband Albert in 1968 and by her daughter Kathleen (Mrs. Jack Nesbitt) in 1991. At her funeral, Jack Nesbitt told of her conversion and life and William Metcalf spoke at the service and the grave. She leaves behind four grandchildren, John, David, Daniel and Rebecca, all saved. Mrs. Nellie Macfarlane of Glen Ewen, Saskatchewan on April 22, age 83. Our dear sister was saved at the age of 24 in the town of Estevan. She came into fellowship in the Glen Ewen assembly shortly after and faithfully attended the meetings for more than 50 years, until age and health prevented her. She was known for her quiet, Christ-like manner and her care for the saints. Jim Hanna presented the gospel to a large funeral audience. Mrs. Macfarlane is survived by her husband Gordon, one sister, five children, 13 grandchildren and four great-grandchildren. Mrs. Verna McWilliams (nee Foreshew) of Pickering, Ontario on April 25. Our dear sister, for many years in the West Hill assembly, passed into the presence of her Lord quietly at home. Her brothers, Albert and Russel and a close friend of the family, Sam Martin, who was a great comfort to them, all spoke at the large, well-attended funeral. Mrs. Mc-Williams leaves her husband Roderick, a son, two daughters and four grandchildren. Otto Tompkins of Sault Ste. Marie, Michigan on April 29, age 86. Our dear brother was associated with the assembly for many years. However, due to health restrictions, he had not been able to attend very many assembly meetings the past few years. He is survived by his three sons in Michigan and one daughter in Florida. At his request, a tape Otto made was played at his funeral service.